“If you don’t put it all in and go for it, then you never find out what you can accomplish.” JazzErie Scholarship winner Michael Miller doesn’t want to end up wondering if he could have really done something with his music. 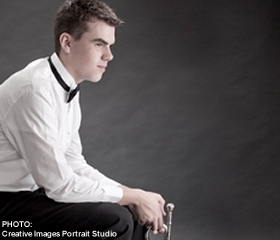 He’s enrolled at the University of Michigan (Ann Arbor) School of Music this fall to find out. His plan? “Get my undergraduate degree in vocal performance, a Master’s degree in performance and then my Ph.D. in conducting.” Any questions? “But my main instrument is my voice.